Pennsylvania Ballet's Sydney Dolan in rehearsal for The Nutcracker. Photo by Arian Molina Soca, Courtesy PAB. Each year, the Princess Grace Foundation, honoring the legacy of Princess Grace Kelly of Monaco, offers awards to distinguished artists spanning the fields of theater, film and, of course, dance. The 2018 winners were just announced and include nine dancers and choreographers, five of whom—Sydney Dolan, Catherine Hurlin, David Adrian Freeland, Dana Genshaft and Claudia Schreier—hail from the ballet world. In addition to this list, choreographer Kyle Abraham received a Statue Award, recognizing his success since winning the Princess Grace Award in 2010. 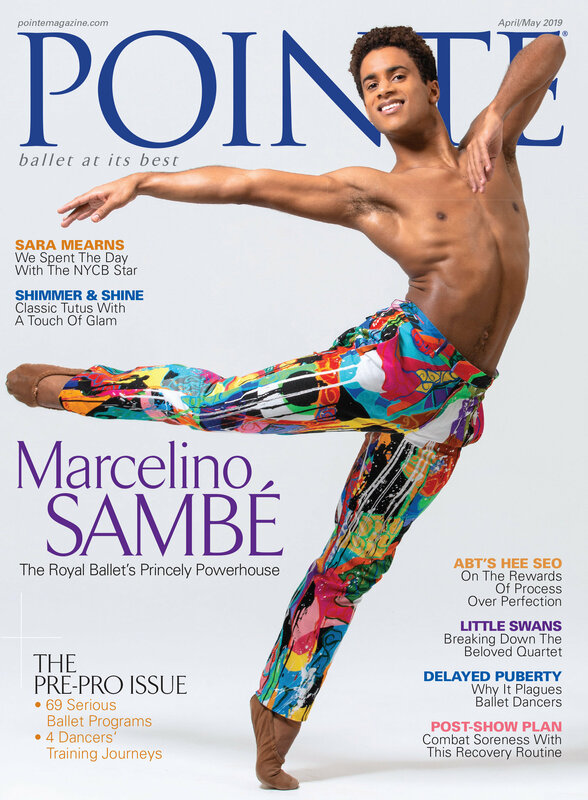 We can't wait to see Abraham's first-ever work for a ballet company at New York City Ballet's fashion gala this fall. We've included more info on the ballet-affiliated winners below. Dance awards outside of the ballet realm go to Juilliard School student Matthew Gilmore, New York University student Aliza Russell, Abraham.in.Motion dancer Marcella Lewis and Gibney Dance Company member Shamel Pitts. You can read more about all of the awardees here. Sydney Dolan in Balanchine's "Rubies." Photo by Arian Molina Soca, Courtesy PAB. Catherine Hurlin (center) with Dunan Lyle and Roman Zhurbin in Alexei Ratmansky's Whipped Cream. Photo by Doug Gifford, Courtesy ABT. David Adrian Freeland with Jacquelin Harris in Katarzyna Skarpetowska's Cuore Sott'olio for Ailey II. Photo by Eduardo Patino, Courtesy AAADT. Dana Genshaft in San Francisco Ballet's production of Alexei Ratmansky's Foreign Lands. Photo by Erik Tomasson, Courtesy SFB. Claudia Schreier in rehearsal with students at Ballet Academy East. Photo by Rosalie O'Connor, Courtesy Schreier. How does ABT's Clara "Shrink to Mouse Size"? Last Sunday and Monday, I had the opportunity to perform in Works & Process at the Guggenheim Museum. It was so much fun! Before the performance, there was a company class with ABT that I got to take--and wow, the company dancers are soooo good. It was amazing to be in the same class with them. After we'd warmed up, it was showtime. I performed the Snow scene and my friend Mikela (one of the other Claras) performed the end of the Battle scene from the new Nutcracker. Then company members danced the Spanish and Russian dances , and Marcelo Gomes and Veronika Part performed the Sugar Plum pas de deux. It was so fantastic that I wanted to cry and scream at the same time. I can't wait to see the whole ballet put together, and to watch all of the casts do the pas de deux! I've also been able to peek at a lot of the costumes. They're beautiful! All the party scene stuff looks like it's from the very early 1800s. And the mice costumes are so mean and evil: They're this dirty white color with pink eyes, ears, noses and tails. The Mouse King has seven heads and seven tails! They've showed us the layouts of the scenery, too. I especially love the party scene. To make it look like I shrink to “mouse size,” they make the whole room HUGE. At one point, I have to sit on top of a 20-foot chair--which started out smaller than me! I throw my shoe at the Mouse King from this huge chair! Read the other guest blog posts by JKO School student Catherine Hurlin, who's rehearsing the role of Clara for ABT's new Nutcracker, here and here. What Scares ABT's Clara? Giant Chairs! This week I got the opportunity to try out a giant chair that is going to be part of the Nutcracker set, which was cool--but also a little scary! When I'm up on the chair there is only room for me to stand in first position. I literally cannot move anywhere else. Also, the platform is slanted, so it is hard to keep my balance. Luckily there's a protective bar around me so I can't hurt myself. When the stage manager told me that I had just 10 seconds to get on the chair before they move it onstage, I got a little nervous. But I think it'll be OK--the stage manager is great, and I trust him. I am also working on the party scene. We finally got to the moment where I meet Drosselmeyer, and now we're all the way up to the part where he brings in the magical dolls and then gives me the Nutcracker. I have also been working on the battle scene. One of the company members got to try dancing with the new mouse head. He looks amazing--very creepy. This is truly going to be the best ballet of them all! Can’t wait to see it all together. See you next time! Read the other guest blog posts by JKO School student Catherine Hurlin, who's rehearsing the role of Clara for ABT's new Nutcracker, here, here and here.